A new robot can assemble a wooden IKEA chair in eight minutes and 55 seconds. A team of scientists at Singapore’s Nanyang Technological University have built a robot that can assemble a $25 chair from IKEA, according to a statement released by the university today. It takes the bot about 20 minutes to complete one. While it takes the bot longer than humans usually take to assemble the chair — an IKEA spokesperson said it takes about 10 minutes to complete one — it’s nevertheless another step forward in the field of robotics. Especially when you consider the robot that ended up in a public fountain when it was supposed to police the Washington Harbor complex, or another that tripped and fell over a light projector during a demo onstage. NTU’s robot, which took three years to build, consists of two arms and a 3D camera that lets it read the furniture parts presented to it. Then, it designs and executes a plan to assemble the furniture using algorithms developed by the NTU team. To ensure the robot doesn’t use too much force when holding onto something and pushing them together, its arms are equipped with force sensors. More time is taken for the robot to plan than to execute the assembly process. The bot isn’t smart enough to build what you want it to just based on what you tell it yet, though that could change in the next decade. 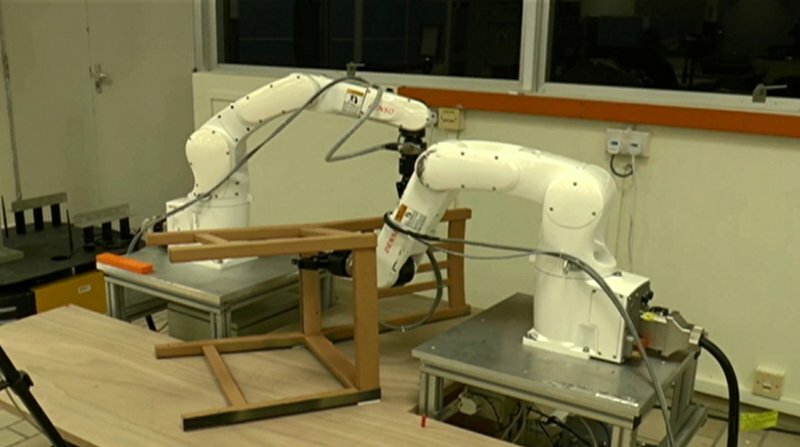 The NTU team is looking to integrate more artificial intelligence so that you may get the robot to put a piece of furniture together simply by telling it what to do or showing it an image of a finished item. “We have achieved the low level capability to teach the robot ‘hot to do it’ and then in the next five to ten years, high level reasoning — the ‘what to do’ — could be done too,” team member Quang-Cuong Pham told Reuters.